Great product! And very fast shipping! Really handy - not what I'd think of as a "safe" but it's much safer than "just lying around". Obviously this thing is not "high security" the way a rated safe would be, but it's really handy to have some peace of mind about leaving a room with sensitive things, and the price is great for the value. It does have a slightly rough feel to it, but all the basics you would want are there. 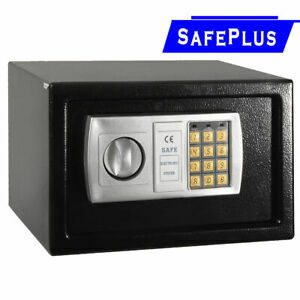 THE SAFE IS STRONG AND ROOMY FOR FIREARM AND OTHER IMPORTANT ITEMS, WE WENT OVER THE SIMPLE INSTRUCTIONS FOR ABOUT 20 MINUTES AND COULDNT SET OUR 4 DIGIT CODE, SO IF WE KEEP IT WE WOULD ONLY HAVE ACCESS TO USING THE KEY. IF WE RETURN IT WE ARE RESPONSIBLE FOR SHIPPING CHARGES, SORT OF UNFAIR DUE TO A DEFECT ON THE SAFE'S PART THAT WE COULDNT SET THE CODE LIKE IT STATES.